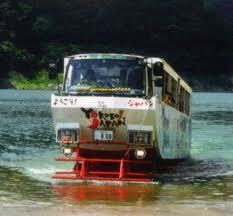 BUS OR BOAT? BOTH ! 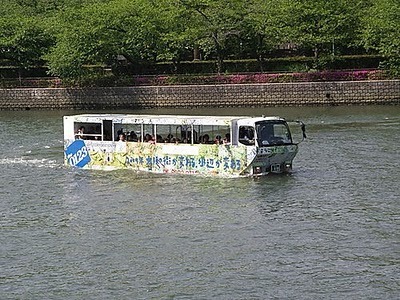 Unique sight-seeing vehicle in Osaka, The bus is driving around in Osaka and after that, it changes to boat to go into river. 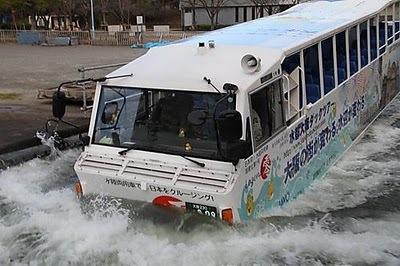 It takes passengers to historic Uemachi-Suji Avenue, Osaka Castle, and then, at Sakuranomiya Park (famous for cherry blossoms), it splashes into the Okawa River, “swims” across it, lands on the opposite bank and continues driving along Osaka City’s artery, Midosuji. The tour lasts about 100 minutes. 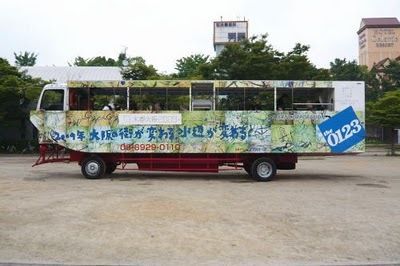 It is accompanied by entertaining guide, who explains about the city of Osaka in an interactive manner.